In the Gospels, we get a sense of God’s compassionate heart when we read accounts of Jesus healing children who were sick and suffering. We believe that as we care for special children like these, it brings hope for today and for eternity, and God is glorified. At two of the locations in India where Send HOPE Now provides support, about 58 young girls, of no fault of their own, are living with HIV/AIDS. Their families, unable or unwilling to care for them, brought them to a Home of Hope, where they now receive loving care and much needed medical and nutritional support. Their quality of life and prognosis is greatly improved. We call them “Special Girls” because that is how God sees them. Send HOPE Now is committed to connecting you to this need so that these special girls can have a safe, loving home in which to live. The buildings at the first location where the girls are living, are in such disrepair that it has become unsafe for them. Caregivers are doing their best under the circumstances, but leaky asbestos roofs, inadequate toilets, and not enough square footage, all add up to an unhealthy—even dangerous—situation. At the second home, the existing buildings are adequate, however they have run out of space. More girls are waiting to come into the home, but there is not room in which to fit them all. In both locations, the government has made it clear that new facilities must be provided, in the best interest of the children. ASHA SADAN HOME FOR SPECIAL GIRLS will be built on the opposite side the property already owned by Calvary Chapel Trust, India (CCT), where a home for special boys has been built and is operating. It will replace the dilapidated classrooms currently being used for housing the girls. The new facility will house up to 40 girls and will meet government child-safety standards, including a masonry perimeter wall, locking gates, lighting, and closed-circuit camera system. The same local contractor who built the boys dormitory estimates construction will take 5-6 months to complete, once it is fully funded. EDEN HOME FOR SPECIAL GIRLS, is slated to be built on the 22-acre CCT-owned property purchased in the early 2000s in another area of India. There are currently 40 girls who live in existing buildings, and this new facility will expand capacity to another 40 special girls. When God provides the money for this building, it is expected to take 5 to 6 months to complete construction. What we have seen, over the years, is that as we care for the "least of these” (Matt. 25:40), doors of opportunity are opened in the community; with relatives of the special children, with friends, and even with local authorities. People become curious and are open to know more about the reason for the hope that we have (1 Peter 3:15). The result? Not only do these girls receive the love and care they need so urgently, but the good news of Jesus begins to take root, to bring eternal life. Because of the urgency of this need, timing is critical. 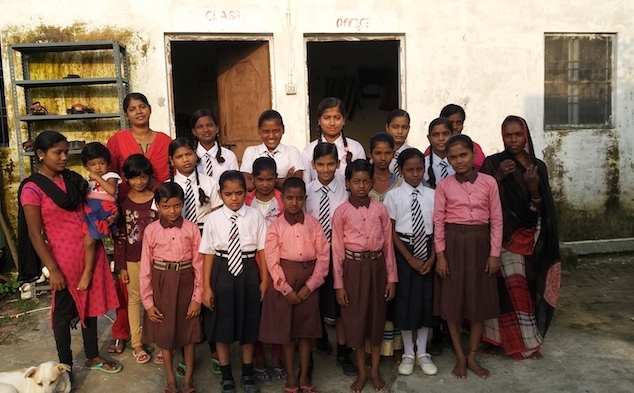 We are believing the Lord to provide the $192,000 needed to construct the two girls dorms in India by the end of this year, so that they can break ground early in 2019. One of our partner ministries, Fifty-Two.4 (check them out! ), has already started raising funds towards this project through their running fund raising campaign. This is a great opportunity for you to give HOPE for today and for eternity to girls who are in dire need of a safe, loving home.